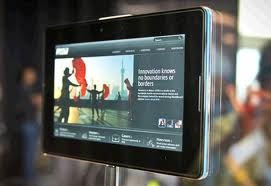 I am Therefore iPad: IPad Competing Tablet: Is BlackBerry PlayBook dead on arrival? IPad Competing Tablet: Is BlackBerry PlayBook dead on arrival? The BlackBerry PlayBook tablet from Research In Motion goes on sale Tuesday, April 19, 2011, with what seems to be little consumer interest, mediocre reviews and few chances to match the success of Apple’s iPad. Starting at $499 for a 16GB WiFi model, the PlayBook will cost you $599 for the 32GB variant and $699 for the 64GB model. The tablet runs on a 1GHz dual-core processor, has a 7-inch display and dual cameras (5MP on the back and 3MP on the front). But what’s putting the PlayBook down is the software. By far the biggest omission is the lack of a native e-mail client. Yes, you have read correctly: a BlackBerry-branded product, famed for extensive e-mail capabilities, will not ship with a built-in e-mail client. You will have to use the Bridge app instead, which tethers your phone’s PIM to the tablet, further limiting the appeal of the PlayBook to current BlackBerry smartphone owners. Rushed to the market to counter the iPad 2 and several similar Android tablets, the PlayBook already showed signs of software fatigue since it was in reviewers’ hands earlier this week. They noted a severe lack of third-party apps, buggy software and twitchy Flash performance in the browser. There isn’t even an app for video calls with the built-in 3MP front-facing camera. Panned by reviewers and half-baked, it’s no wonder that the first reports on the launch day of the PlayBook are not positive either. In Canada, the home country of Research In Motion, the Financial Post says the PlayBook won’t hit a home run, but might have to settle for a bunt. CityNews Toronto also reports on the lack of lines outside stores, and the little fanfare to accompany the launch. Perhaps it’s time to call the BlackBerry dead on arrival and wait for RIM to come up with a better iPad killer. For users who don’t want an iPad, there are still Android alternatives out there, such as the T-Mobile G-Slate, coming out Wednesday.